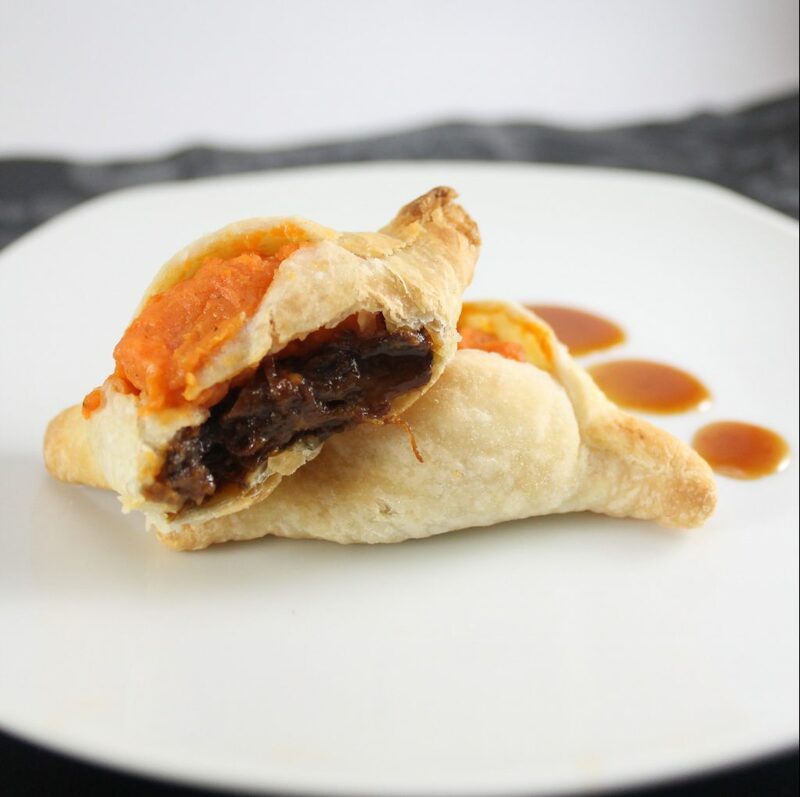 Sweet Potato Bbq Beef Hamantaschen - No Way That's Healthy! This is the ultimate Purim seuda starter. Festive, flavorful and bound to impress your guests. They don’t need to know how simple it was to put together, it can be our little secret. Though you may find them asking for the recipe soon after tasting them. I’m not even sure you can call this a recipe, you just throw together tasty ingredients and get awesome results. 2-3 sweet potatoes, peeled and boiled till soft. Place the meat in a pot on the stove. Pour over most of the bbq sauce, leaving some left over so you can serve as a sauce on the side. Cover and cook on medium heat. Check the meat every so often and add water if needed to just cover the meat. Depending on the type of meat you used, it could take 2-3 hours till the meat is soft. Once it is soft enough shred and return to the pot to cook another 30-60 minutes. By this time it should be a thick, saucy meat mixture. Set aside. Mash the boiled sweet potatoes well and season with salt and pepper. Slightly defrost the malawach dough and roll out just a bit. Flour the surface underneath so it does not stick. Cut out rounds of dough. 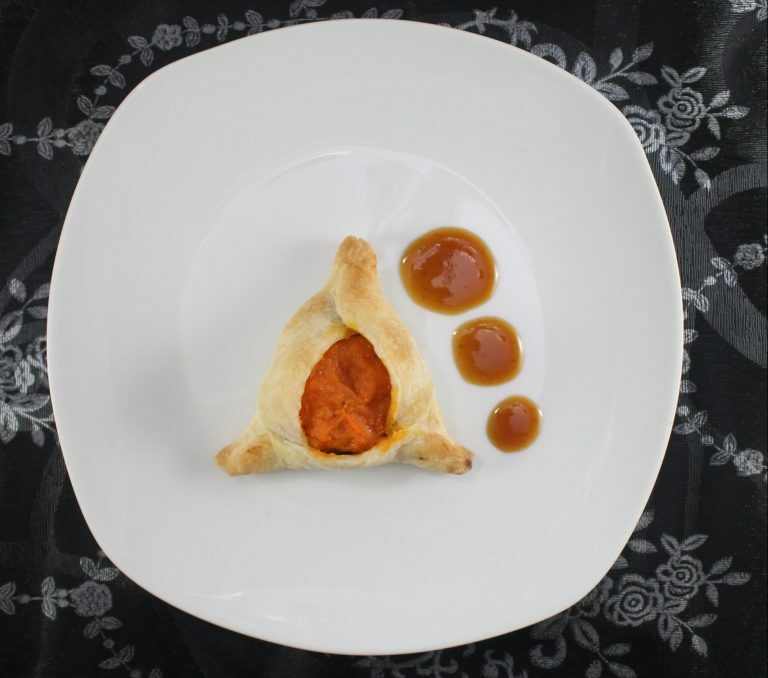 In the center of each round place a spoonful of meat followed by the mashed sweet potato. Fold in the dough to create a triangle. You can egg the dough here if you’d like. Bake at 350˚F for about 20 minutes or until the pasty is crispy and golden. Serve with extra bbq sauce on the side. Whisk together all the ingredients. Feel free to double or triple this recipe, it’s that good! These will stay closed if you fold the dough instead of pinching. See picture of whole hamantasch, They are folded one over the other. This will ensure they stayed closed and look beautiful! This looks delicious! I’d like to try it but I’m wondering how many hamantaschen this recipe makes.